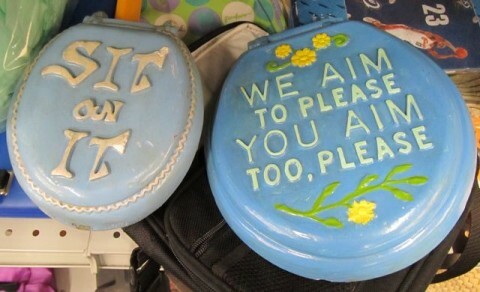 THESE fairly large and heavy plaster offerings were reasonably priced at my local Salvation Army store for $1.95 (“Sit On It”) and $2.95 (“We Aim To Please…”). They reminded me of a little metal sign we got as a gag gift at a pool-warming party we had one summer when I was a kid. It read “We Don’t Swim In Your Toilet, Please Don’t Pee In Our Pool” in a tall, old-fashioned typeface. The sign was vertically formatted, small, only about 3″ wide by 6″ tall, and had holes in each of its four corners so that it could be screwed into place. We never put it on the pool. The sign remained in our junk drawer for as long as I can remember. Thank God. Thank God, because attaching it probably would have ruined the brand new showpiece of our backyard and indeed, the pride of the neighborhood – – truly a catastrophe, especially given that Dad spent nearly an hour inflating it and then filling it with the hose. Posted by Ted on February 16, 2012, 5:20 AM.